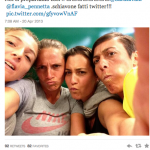 So…does Fed Cup look any different? The Changeover went live on October 28, which was only two weeks ago! It’s been an absolutely phenomenal beginning, and we thank you from the bottom of our tennis-obsessed hearts for all the support. Please feel free to e-mail us, tweet us, or leave a comment. We pick the winners for the Paris Masters final between Jerzy Janowicz and David Ferrer, and Fed Cup final matches featuring Petra Kvitova vs. Ana Ivanovic, and Lucie Safarova vs. Jelena Jankovic. 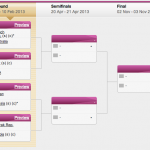 We pick the winners for matches on November 3, 2012 at the Paris Masters and Fed Cup final. Lucie Safarova, Petra Kvitova, Jelena Jankovic, and Ana Ivanovic. All of them are awesome in their own unique and special ways. I mean what could possibly go wrong? Okay, so the truth is that a lot could go wrong. And I mean A LOT.